Some people are much easier to annoy than others, but everyone has their limits. 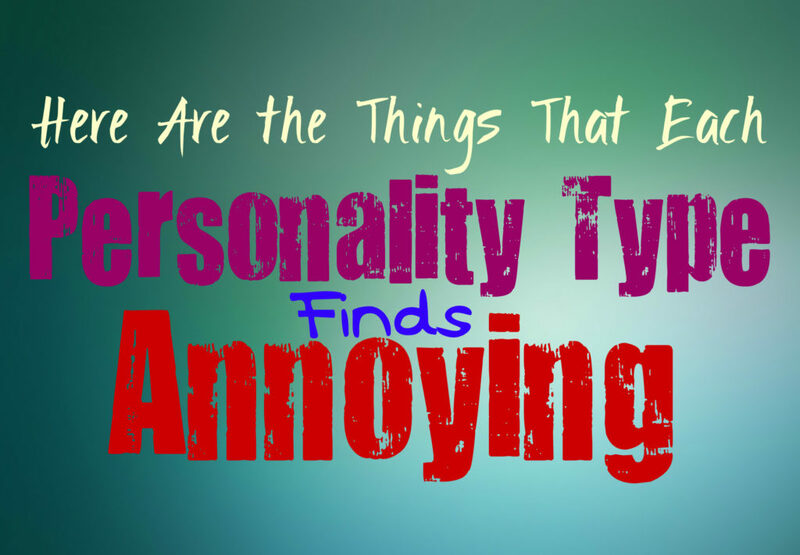 Here is how you can annoy each personality type. Disrespectful people is one of the most annoying things for an INFJ. If someone is being rude or obnoxious, and trying to take over a situation, INFJs will become extremely frustrated. They dislike arrogance and selfishness, and simply want people to respect and care for one another. Seeing any kind of injustice in the world is both annoying and frustrating for INFJs. They also become extremely annoyed when people invade their personal space, and do things like read over their shoulders. Any kind of loud or pushy behavior is extremely annoying for INFJs to be around. Loud noises of any kind are generally very annoying for INFJs, since they enjoy peace and quiet in their lives. ENFJs become extremely annoyed when they see people being cruel to others. This sort of obnoxious behavior can truly upset the ENFJ. They believe that people should try to be kind to one another, and hate disrespectfulness. They do not like fake people and become truly annoyed when they have to be around these types of individuals. ENFJs will often get a strong sense of who someone is and know when they should not trust someone. If the people close to the ENFJ don’t believe their suspicions about someone, they become extremely annoyed by this. INFPs become annoyed by people who invade their personal space and show obvious disrespect. If someone is loud and aggressive, the INFP will become extremely annoyed. They also dislike people who are insincere, and will become rather annoyed if they have to spend time around people like this. Having to be in social situations with people they do not like is certainly not a fun experience for INFPs. It is truly important for INFPs to have their own space and plenty of time alone, so having someone who does not disrespect this is extremely annoying for them. ENFPs are often extremely annoyed by people trying to control them and judge their decisions. They prefer to make their own choices in life, and enjoy having freedom. If ENFPs are surrounded by judgmental and controlling people, they will be constantly annoyed. Having too many rules placed on them and their relationships, is certainly irritating for the ENFP. Although ENFPs are social creatures, they can often be seen as the more independent extroverts. They often dislike loud noises, or people who have no respect for their space. They have extremely active minds, and can become bothered when people do not let them have peace and quiet sometimes. ENFPs also become annoyed by people who ignore them, especially when they pretended to be interested at first. INTJs are extremely annoyed by ignorance and actually seek to be as knowledgeable as possible. If someone is willfully ignorant and doesn’t have any desire to change, the INTJ will become extremely irritated by this. Someone who is shallow and brings absolutely no value to a conversation, is going to drive the INTJ absolutely bonkers. They want to spend time with people who are intelligent and have complex and interesting minds. They enjoy having their own space, and dislike people who do not respect this. They will become extremely frustrated by loud or obnoxious individuals. INTJs might become annoyed by loud noises in general, since it can disrupt their thinking process. They prefer to spend time inside of their own minds, and anything that interrupts this is going to irritate the INTJ. ENTJs become annoyed by people who are inefficient and don’t know how to get things done. If someone is completely lazy and doesn’t take care of important tasks, the ENTJ will become annoyed by this. They do best when they are around people who can properly follow orders and get things done to their high standards. When people blab about unimportant topics, or things that do not pertain to the task at hand, ENTJ will actually become extremely aggravated by this. They prefer to remain focused on what needs to get done, and hate when someone rambles about pointless topics. INTPs dislike feeling like someone is judging them, and actually become very annoyed by this. If they are spending their energy explaining something to someone, the INTP wants to be sure that person is actually paying attention to them. Feeling like someone is blatantly ignoring them, is going to irritate the INTP, and cause them to retreat inward. INTPs also become annoyed when people intentionally criticize them, but do it in a more discreet way so that they can deny it later. This sort of manipulation is unbelievably frustrated for an INTP, and will cause them to try and avoid the person entirely. ENTPs become annoyed by people who feel a need to control others. They prefer to have their own space and freedom, and really dislike when someone tries to place demands on them. Feeling like they are being given an ultimatum is actually extremely annoying for an ENTP. They also become annoyed by people who disagree with them but won’t back it up with a debate. They enjoy being able to debate different topics with logical information, and love being able to learn from an intelligent person. Someone who simply disagrees with the ENTP but fails to actually back this up, is very annoying for them. ISTJs actually become extremely annoyed by inconsistent people. They prefer to spend their time with loyal and sincere individuals, and dislike anyone who is dishonest. ISTJs are often seen as reliable, because they are honest and upfront about who they are and what they want. ISTJs also become annoyed with people who are loud or obnoxious, and do not respect their personal space. They are introverted people, and because of this the ISTJ needs plenty of time alone. If someone does not respect this, and decides to push the ISTJ, they will become very frustrated. ESTJs become extremely annoyed by lazy people, especially if those people are living in the same house as them. ESTJs certainly pull their own weight, and simply want people around them who will do the same. They become increasingly annoyed by lazy or messy people, and will have a hard time keeping quiet about this. They want people to help them get things done, without the ESTJ having to ask them to do this. They expect that people around them should be working as a team, instead of just expecting everything to be handed to them. ESTJs are hardworking people, and they respect people who share this same quality. ISFJs become annoyed by people who are cruel or pushy. They dislike seeing someone be mean to others, and often do not understand the reasoning behind this. ISTJs are caring people and because of this they do best when they are around other people who are considerate and kind. ISFJs also become annoyed by people who are messy and do not clean up after themselves at all. Constant disorganization in their environment is something that is going to really drive the ISFJ crazy. They enjoy peaceful and clean surroundings, and prefer to be around people who respect this. ESFJs become annoyed by people who lack compassion and do not try to understand others. They are giving people, and also become frustrated by individuals who take advantage of this. They want to be appreciated for their efforts, and enjoy when people express this to them. Having someone blatantly disrespect them, is actually very annoying for the ESFJ. They enjoy being around people who are intelligent and considerate of the feelings of others. ISTPs become annoyed by loud or pushy people, and prefer to have their own space. If someone does not respect the ISTP desire to be alone, this is very frustrating for them. They prefer to be able to make their own choices and if someone tries to push their opinions onto the ISTP, they will be extremely annoyed. They want to be around people who let them be themselves, and who trust the ISTP intelligence. Independence is extremely important for ISTPs, so having someone place certain expectations on them and their relationship, is actually rather annoying for them. ESTPs become very annoyed by ignorant people, especially if those people will not listen to reason. They are often eager to inform others, and enjoy being able to help someone learn about something new. If people are not willing to listen to the ESTP when they want to explain something to them, it is very annoying to them. ESTPs also become annoyed if they feel like they are being ignored. They want their loved ones to pay appropriate attention to them, and become irritated and even angry if they feel like they aren’t a priority. Someone who is cruel or rude is actually extremely annoying for ISFPs. They prefer to be around people who do not judge others, and enjoy feeling free to be themselves. ISFPs also become annoyed if they feel like their loved ones are ignoring them and do not care about their needs. They want to be important to their loved ones, and dislike feeling like they do not matter. ISFPs become annoyed by people who are inconsiderate and controlling, and will often avoid these people at all costs. ESFPs become extremely annoyed if they feel like they are being ignored. They want to be valued by their loved ones, and will truly dislike being neglected by them. The most annoying thing possible for an ESFP is to be ignored by others. They will often act out as a way to gain the attention of their loved ones, and will need reassurance if they feel like they have been pushed aside for something else. They simply want to know that they matter to their loved ones, since they ESFP will never ignore the people they care about.